The Syrian Arab Army (SAA), allied Palestinian militias, and the government of Syria deserve high praise for the recent liberation of Yarmouk refugee camp from ISIS. This would be a good time to set the record straight and reaffirm our position that Palestinians and Syrians have strong common national aspirations. The aspiration of Palestinian refugees to return to their homes in Palestine is recognized as part of the common struggle of all Syrians. And both nations seek to reclaim from the State of Israel all the territories in Syria and Palestine which it currently occupies. Yarmouk was originally a refugee camp for Palestinians who had been displaced by the “Nakba”, the catastrophe of the ethnic cleansing of the indigenous people of historic Palestine which accompanied the founding of the State of Israel in 1948. It was a .81 hectare of land which, in 1957, was outside the boundaries of Damascus but which, by 2011, had turned into a lively suburb of the city housing about one million people of whom about 160,000 people were Palestinians. It was the largest and most prosperous settlement of Palestinians anywhere in Syria. It is important to note that the government of Syria treated its hundreds of thousands of Palestinian refugees better than most Arab countries and as equals to Syrian citizens themselves. Palestinians in Syria received the same levels of free health care and education as Syrians and were allowed to rise in all areas of employment as high as their abilities carried them. There was only one formal legal distinction between Syrians and Palestinians. Palestinians were not given Syrian citizenship – in order to maintain their internationally-recognized right of return to their homes in Palestine – and therefore were not allowed to participate in Syrian elections. Finally, the Syrian government, along with Iran and Hezbollah, was part of the Coalition of Resistance against Israel for many years. It was no accident therefore that, before the US-led aggression against Syria in 2011, the Palestinian factions chose to locate their headquarters in Damascus. In short, the Assad government was a staunch supporter of the Palestinian cause. In 2011, a group of western countries and Arab monarchies, led by the USA, unleashed scores of proxy armies of terrorist mercenaries on Syria with the purpose of achieving regime change, a scheme clearly illegal under international law. Importantly, the State of Israel participated heavily in this regime change operation, supporting terrorist mercenaries using the illegally-occupied Golan Heights as their base to fight against the Syrian government inside of Syria. Israel also used its air force to bomb Syria more than one hundred times during the course of the seven-year long war and supplied aid and weapons to separatist Kurdish elements in eastern Syria with a view to aid the USA in trying to partition that country. In this context, negotiations took place for the Palestinians in Syria to remain neutral in the war. The Syrian government supported this view but the terrorists didn’t. In 2012, the so-called “Free Syrian Army” (FSA) invaded and occupied Yarmouk. Some Palestinian factions facilitated their entry. The FSA was soon joined by al Qaeda and other militant factions. In 2015, ISIS entered the camp and, after some internecine warfare, drove out the other terrorist factions. As they did in many other pockets of Syria, the terrorists evicted many Palestinians from their homes, looted and plundered everything of value, arrested anyone with known sympathies for the government and/or religious beliefs different from theirs and proceeded to torture and execute them, sexually assaulted and/or kidnapped women and girls, turned Yarmouk into a fortified camp, and hoarded all the foodstuffs for themselves. As in every other terrorist enclave, the vast majority of the inhabitants promptly fled to government-held areas. The Syrian government did not directly attack Yarmouk until just a few weeks ago. Instead, it patiently armed and supported the courageous fighters of the Popular Front for the Liberation of Palestine – General Command (PFLP-GC) who, for many years, led the unremitting struggle against the terrorists inside the camp. In other words, the Syrian government respected the neutrality requested by the Palestinian organizations. In 2012, certain self-styled Palestine solidarity activists and western “leftists” sought to twist the facts about the second displacement of the Palestinians – this time from their homes in Yarmouk. They sought specifically to lay the blame for this second victimization of the Palestinians in Yarmouk on the Syrian government and effectively gave left cover and support to the western regime-change operation. According to the nay-sayers, the Syrian government was simply to cave in to the armed militants and ignore its duty to protect its citizens and the Palestinian refugees, who lived under its protection, from foreign aggression. From personal experience in Canada, we can attest to the fact that the Left cover provided by these misguided people for the attempted US regime-change operation in Syria was poisonous to the Canadian anti-war movement. It made it hard to organize people against the illegal war. In fact, it became difficult, thanks to threats by anarchists and other intervenors, even to find a venue to hold a public meeting in Canada for outspoken and courageous opponents of the war on Syria, such as Mother Agnes Mariam and Eva Karene Bartlett. In a few short years, because some of these misguided people, specifically members of the International Socialists (IS), were in positions of authority within the pan-Canadian anti-war movement, the movement dried up and died. We note that many people got it wrong at the time. It’s heartening that some of them, such as journalists, Max Blumenthal, Rania Khalek, and Ben Norton have publicly acknowledged that their earlier analysis and criticisms were wrong.2 Others, such as UK professor Gilbert Achcar, who travelled to the World Social Forum in Montreal in 2016 to villify the Syrian government, will probably dance to empire’s tune until they die. It has taken seven years but the recent string of victories of the Syrian government over the terrorists have forced many honest people on the left to open their eyes wide and realize that what has transpired in Syria is not a popular uprising and or a “revolution”, but a deadly plan by the US, its western allies, and regional clients criminally to interfere in the domestic affairs of Syria and to target Iran and the Coalition of Resistance. Thankfully, with the help of its international allies – Russia, Iran, Hezbollah, and several Palestinian popular militias – the Syrian Arab Army and government, after much sacrifice, has finally gained the upper hand and has driven the terrorists out of many of the enclaves they seized and occupied, including Yarmouk, thus defeating the US regime change plan. In response to the failure of that plan, the USA moved to its Plan B: direct attacks on, and the occupation of, a large swath of Syria with a view to partition the country. On April 13, 2018, in response to a fraudulent “chemical attack” staged by the White Helmets3, the USA, UK, and France launched 100+ missiles against Syria. Interestingly, the Palestinian peak organizations immediately condemned the missile attack, and came out strongly in support of the government in Damascus, thereby abandonning any pretence at neutrality. The liberation of Yarmouk and the angry Palestinian reactions to the April 13 missile attacks put a satisfying end to a chapter of disunity in Palestinian and Syrian history. They show that the Palestinian and Syrian struggles are one and the same. There can be no ultimate victory for Palestine if Syria is destroyed. There can be no ultimate victory for the Syrian people without also freeing the Palestinians from the tyranny of occupation in Palestine. The moral of the Yarmouk story can be summed up thus: if you are for Palestine, you must also be for Syria! Those self-styled Palestinian solidarity activists and “leftists” in Europe and North America who slammed the Syrian government for resisting the terrorist proxy armies of the West need to reflect on the consequences of their de facto support of the US empire’s meddling in Syria: half a million deaths, millions of injured people (both physically and emotionally), enormous destruction of civilian infrastructure (including housing, schools, and hospitals), the transformation of 12 million Syrians into displaced persons and into a wave of refugees that swept over Europe, the descent of thousands of Syrian women and girls into the international human trafficking trade, and much much more… Will there ever be a day of reckoning for these apologists of empire? The liberation of Yarmouk refugee camp is a significant milestone in Syria’s struggle to regain its national sovereignty and territorial integrity. Eventually, all of Syria will be liberated from the terrorists and from the direct occupations of the USA (east of the Euphrates), of Turkey (in the north), and Israel (in the south). 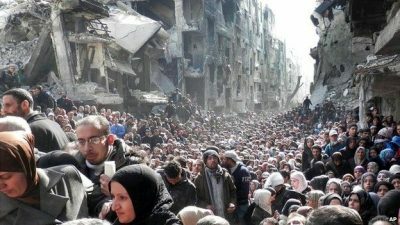 In the meantime, the Palestinian residents of Yarmouk will soon be able to return to their homes in southern Damascus. And, when Syria is completely liberated, they will be able to organize once again – with the help of the Syrian government – for the Day of Return to Palestine. Ken Stone is a veteran antiwar activist, a former Steering Committee Member of the Canadian Peace Alliance, an executive member of the SyriaSolidarityMovement.org, and treasurer of the Hamilton Coalition to Stop the War [hcsw.ca]. Ken is author of Defiant Syria, an e-booklet available at Amazon, iTunes, and Kobo. He lives in Hamilton, Ontario, Canada.